Degrassi Debate: Does The Show Need More Tall Female/Short Male Couples? You know there isn’t much happening in Degrassiland when even Degrassi joins in on posting fake spoilers and the like. I don’t have as much time as I’d like to review older episodes, so I wanted to take on random questions and premises presented throughout the fandom during this down period. I have noticed that all the couples on the show are either male taller than female or the same height. But I have hardly ever seen a female taller than the male. This bothers me because some men are short and some women are tall. The man isn’t always taller than the woman. I think the only time we had this storyline was with Dave and Sadie. They should have more of them. What do you think about this Kary? Degrassi did a storyline in season 10 in which Dave was initially embarrassed to date Sadie because she was taller than him. We could literally sit here all day and nitpick Degrassi in terms of which groups/traits/etc it doesn’t show often or at all, but I’m not sure if I even want them trying to stretch themselves to be that broad in an attempt to please everyone. I’d like to think we’re all on board with the show infusing more culture and people of color. There are specific storylines we all want to see them deal with. But if we’re expecting a broad variety of “types” that represent everyone in existence, down to specific physical traits, where is the line drawn to avoid Degrassi diluting its messages because they’re now focused on making sure the show fairly represents every person and scenario in some way, shape or form? The way the initial question is framed, no I don’t want the show to have more tall female/short male couples walking around for the sake of having them simply because the man isn’t always taller than the woman in real life. I think what kind of irks me is that just having this type of couple around has little value if the focus is just wanting to see them together on the show. Dave and Sadie’s storyline was decent, but there was nothing to it after the initial plot, so I don’t see the point in going down that road again by itself. In later episodes up until their breakup I wasn’t thinking “Oh hey it’s cool that Degrassi has a tall girl dating a short guy,” I just saw them as a couple. The same way I’ve never thought of them or even Jenna and Connor as interracial couples, they’re just Dave & Sadie and Jenna & Connor. If anything I’d want to see some sort of relationship form as part of an overall character arch for the female, because there’s no reason to revisit it from the male’s perspective. It’s realistic that tall teen girls are subject to bullying because of their height, and this could lead to issues with self confidence as Degrassi explores how that plays a role in the girl’s relationships. I guess what I’m trying to get at is I’m fine with that kind of couple happening naturally or as part of a bigger whole, but putting them together just to have them represented on the show? No way. 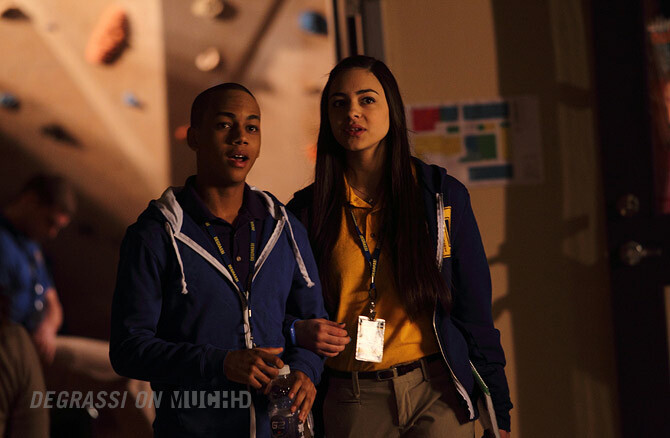 Degrassi is not a show where we want them doing things “just because.” Spemma anyone? Spemma was a joke.. It would be like having Alli & Eli becoming endgame.. I was stupid. It seems that all the females in this show need a lover to be happy? Why?? i known many HS girls who where fine single. So why did they pair up Drew & Becky? Spemma doesn’t really “count” per se because Degrassi intentionally put them together to be ridiculous on their way out. There are plenty of adult females who are fine without a man, but back in the day and even on social media nowadays these younger girls are flat-out obsessed with boys. I still count it, because there were other ways to send those characters off without pairing them together. It did come across to me as Emma needing a guy in her life (and Spinner needing a girl in his) to be complete and to have a “happy” ending. That was actually what I meant by my question because I am the one who asked it to you. I just ran out of characters to explain it and so therefore explained it badly. I meant as part of a storyline not just because they need to have one. Having them for the sake of having them is stupid. Things must always be done for a reason I believe with shows. And yes spemma was stupid. Haha that’s why I answered it over here, I hate that tumblr limits your characters! But yes it’d make a for a great storyline that is relatable, but not overly dramatic. If it fits organically in the show sure, but I wouldn’t want to see two mismatched people together just so there’s a tall girl/short boy couple. It could be an interesting non-dramatic storyline if there’s a way to differ it from what they did with Dave/Sadie. If they had to go the way of Spemma-not saying they did, but if you were to write a Degrassi Takes Manhattan storyline that has them end up married, don’t you think the writers put together a pretty good setup that would have it wind up with them getting married? With the casino wedding etc.